Breaker player Isaac Wulff defends against Godinez, which lost the game 54-37 Friday, Jan. 29. Breakers easily rolled past Godinez 54-37 in a contest played Friday, Jan. 29, in Guyer Gym. Blake Burzell’s nine points in the initial quarter was key to Laguna’s 22-12 edge in the period. The Grizzlies tried a comeback in the third period, but Laguna’s defense limited the visitors to only three points in the final quarter as the Breakers pulled away. 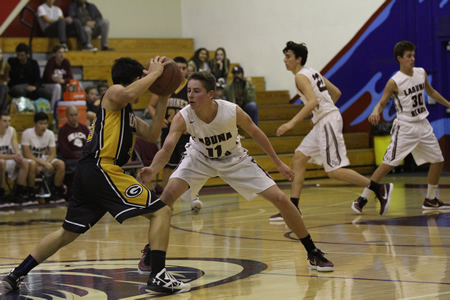 This past week, Laguna hosted second place Costa Mesa (12-11, 5-10 on Wednesday, Feb. 3, as the Mustangs were trying to break a 24-game losing streak to the Breakers and a 14-year losing streak in games played at Dugger Gym. Breakers play on Friday, Feb. 5, at Saddleback (8-14, 2-4). CIF Rankings for Division 4AA (2-1) : 1 – Orange Lutheran, 2 – Alemany, 3 – Cantwell Sacred Heart, 4 – La Canada, 5 – Harvard-Westlake, 6 – Notre Dame/Sherman Oaks, 7 – Serra, 8 – Jserra, 9 – Laguna Beach, 10 – Mission Prep, 11 – San Gabriel Academy, 12 – San Dimas, 13 – St Francis, 14 – Atascadero, 15 – San Marino, 16 – El Segundo. Laguna returned to action on Thursday, Jan. 28, and had to storm back in the final period to beat Godinez 42-39 behind Jackie Cenan’s 27 points. The Grizzlies (9-11, 3-3) looked like they were on their way to an upset win before Cenan led the squad to the win and the Breakers defense created opportunities. Cenan trails Emily Writer’s career scoring record by 50 points with at-least five games remaining. Writer scored 1,570 in a four-year career from 2008-2011 and has an 18.3 career average over the 86 games played. Cenan has played in 84 games averaging 18.1 points per game including a number of contests last season when she was injured and saw limited action. CIF Rankings for Division 4AA (2-1) : 1 – Harvard-Westlake, 2 – St Monica & St Paul (tie), 4 – Marymount, 5 – Rosary, 6 – Duarte, 7 – Covina, 8 – Flintridge Sacred Heart, 9 – St Joseph/Lakewood, 10 – Lompoc, 11 – Foothill Tech, 12 – El Segundo, 13 – Estancia, 14 – Notre Dame Sherman Oaks, 15 – Yucca Valley, 16 – Laguna Beach.